The Glamorous Life of a Housewife: Sleepy Town. Night Night time at our house has taken on a whole new meaning now that we have the little bebe. There are four essentials to my little boy's bed time routine that I simply can not live without. All four things that I am about to show you have made this transition into parenthood much easier and has given us less sleep depravation than I was anticipating. First of all, we have the Arms Reach Co-Sleeper. This is what Baby Boy is sleeping in for the time being. It sits right next to our bed and saves me from running clear to the other side of the house during the night. Now, I'm not sure what your stance is on babies being in the same room as their parents, but for us, we plan on having him with us for his first two months (and I can not believe he is almost a month old...where does time go!?) Trust me, I'm all for babies being in their own rooms and that time will certainly come soon for my little Levi but for right now, this just works for us! I L-O-V-E the Arms Reach because it has wheels and I can drag it all around the house with me if I need to. It is much larger than a bassinet, so he has all the room in the world. I read on the website that Halle Berry has this exact same one. Now isn't that fun? The second thing that has been a saving grace is the Snuggle Nest. Levi has been a little flipper flopper since his first week. As soon as you lay him on a flat surface, he rolls to his side! This concerns me since he is so little, so the Snuggle Nest goes inside of his Arms Reach and he can't roll. It's wonderful! It has sounds and when I lay him down for bed, I play the "Momma's Heartbeat" sound, and he lays still instantly. Also, if I am going somewhere overnight that doesn't have a place for him to sleep, I don't have to drag my Arms Reach with me...I can simply bring the Snuggle Nest and place him between us in the bed. How handy! Now, the third bedtime item is a best kept secret! My friend Dani recommended this to me and it is absolutely fantastic. It is the Swaddle Me blanket. Newborns have a reflex where they suddenly throw their arms up in the air and by golly, every time Levi does this, he startles himself and wakes up. At night, we wrap him up in his Swaddle Me blanket and he sleeps much more soundly than during his naps during the day when he is not in it. We save it to only use at night so that he will think, "hey, I'm swaddled - it must be bed time!" 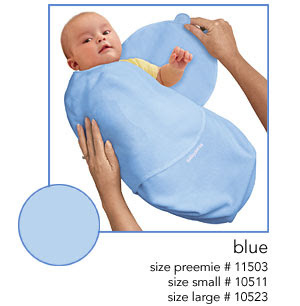 His reflexes do not wake him when he is swaddled and the little guy can sleep longer without any disturbances. I am going to stop using this after two months though, because that is when they lose the "throw-the-arms-up-in-the-air" reflex....and I don't want him to become dependent on having it to sleep. Yet another reason we only use it at night! But I am in love with it and so is Levi. He loves to be wrapped up tight!! Oh, and they have velcro, so they are super easy to use. When you wake up at 3:15 am to feed your baby and change his little diaper, these gowns come in SO handy. There are no snaps or zippers to deal with. You just raise up the gown, change that diaper and get him back to sleep. Sure the little bootie sleepers are cute as can be, but these are much more practical. Levi has several and I plan on getting more. So, just in case you were sitting at your desk or on your couch contemplating what Levi's bedtime looks like, now you know. I recommend any and all of these items to make for a good nights sleep for new Mommies and Daddies. 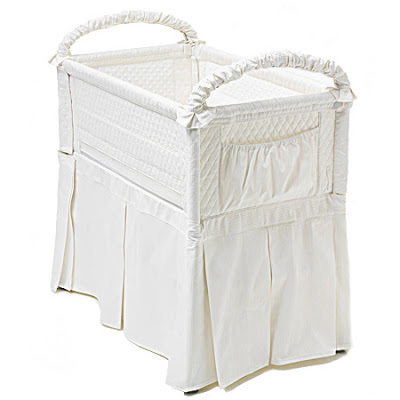 And now I probably jinxed myself and Levi will rebel and want nothing but his Peter Rabbit crib and a diaper. If so, I will let you know so you can disregard everything I just said. We used the SwaddleMe too and it's AWESOME. Bubba did the same thing where he'd wake himself up and ended up being 5 months old before he could go to bed unswaddled. I tried the gowns but didn't care for them. Now I have three brand new, organic cotton ones with the tags on still in a drawer. UGH! Good info! I love reading your baby posts--it makes me feel so knowledgeable about babies, even though I don't have one! Swaddling is aammmaaazzziinnggg. There is a lady at our church who sews huge swaddling blankets and she gives a set to every new Mommy. When Caleb was a wee one, every night Josh took over swaddling duties and wrapped him up tight. It helped so much! I can't wait 'til I have our little one, and I love reading about things that we need. I am going to add to my registry too! The little gowns were one of my favorites too. Jack is to big for them now *tear* And it is HOT here, so he's in a diaper and onesie.. I like his chubby little legs to show! Oooh! Taking notes over here. Love that co-sleeper as an alternative to a basinette. Here's a post idea...take us through an average day/night as Levi's momma! are you kidding?!? Both of my babies slept IN BED with me and hubby until they were about 5 months. It just made nursing so much easier and I'm all about co-sleeping. However, I was very happy to finally make the transition to the crib in their own rooms. Don't worry about what anyone says! You have to what works for you and little Levi! Sounds like you're doing great! Thank you SOOO much for sharing. One of my fears of being a mom is not knowing what to do/buy/invest in etc. When I become a mom, I'm def coming back to your blog and re-reading all this to be prepared!! What a blessing! these things seem wonderful!! hopefully i'll need the advice in the future :) glad things are going good!! Thanks for the tips because I know I need whatever help I can get!! I'll be on the lookout for those things! Awww....itty bitty baby gowns are the cutest! GREAT advice! I am glad I read this :) That sleeper is adorable! My mother swaddled me and she swears by it! I'm glad it's working a treat for you and Levi too. I loved those sleep gowns too! 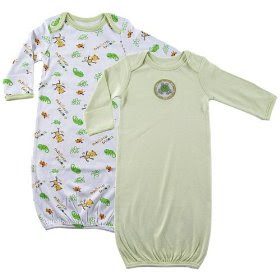 When my MIL bought one for my youngest boy, Silas, I kind of looked at it askance because a nightie? On a boy? I used it once because he had one of those serious laundry days and had nothing left by bedtime and I wished I had a dozen more. Very cute things little Levi has! The baby days are over for me, but I wish I would have had the co-sleeper...love the idea of being able to wheel it around. And I so agree with the gowns. Those things that snap are just too frustrating. I always was sad that my babies were too big and long at birth to use those gowns. They seem like such a good idea...but I give birth to giant babies. LOL! Come by and visit if you have a chance--I'm giving away giftcards to TJ Maxx and Marshalls. I hated those baby gowns - Alex would always kick out of them and then he'd get too cool & plus, Mike said they look too much like a dress...haha! I loved the little Snuggle nest type gizmos - they're GRRReat! Levi is all set! You guys are such great parents. Lol..I'm sure Lil Levi sleeps tight with all his goodies. Co-sleeping, rooming-in is just great! You shouldn't even stop when Levi is two months old ;o). It's great for the bonding! How funny! I am a new mom too and those are the same exact things I think are totally neccessary for newborn sleep!